It might take weeks to get the subway fully operational, but trains above 42nd street will start running tomorrow. Update 1:51 p.m: Finally some details from Cuomo on which trains will be running, starting tomorrow morning. In short: Some things above 42nd street are running, some (but less) stuff is working Brooklyn, nothing over the river to Brooklyn is working, though some to Queens is, and nothing in downtown Manhattan is running either. And, here is a nifty map showing the lines in service. The 1, 2,4,5 and 6 will run above 42nd Street. So will the 42nd St Shuttle S train. The A will operate in two sections locally between 168th St Manhattan and 34th St, and also between Jay Street & Lefferts Blvd. The F trains will make all local stops between 179th St (Queens) and 34th St and in Brooklyn between Jay St & Ave X.
N trains operate between Ditmars Blvd. (Queens) & 34th St., making all local stops. M trains between Myrtle Ave-Broadway & Metropolitan Ave.
Service on the 7, B, C, E, G, and Q trains are still suspended. Here are more details from the MTA press release, via Gothamist. 1 trains will operate local between 242nd Street (Bronx) and Times Square-42nd Street. 5 trains will operate express in Brooklyn between Atlantic Avenue-Barclays Center and Flatbush Avenue. · Between Jay Street/MetroTech and Lefferts Blvd. All shuttle buses will operate north on 3rd Avenue and south on Lexington Avenue. Update 12:19 p.m.: Governor Cuomo says that limited subway service will return to the city, for trains running above 34th street only, he said in a briefing today. MTA Chairman Joseph Lhota during the same briefing, however, said that trains below 42nd Street won't be running, but wouldn't give any other details on which lines and where. "There will be more on Friday and even more on Saturday," he said. Giving us a hint on which trains will get up and running sooner than ever, Cuomo says the R, A, C, L, and 7 train tunnels are still flooded, he tweeted. Nevermind the water, the lower Manhattan lines won't run because of the lack of electricity down there. Also, so far, only three of the city's seven tunnels have had all the water pumped out. Until then, the city will provide a "bus bridge" between New York and Manhattan. 330 buses will take commuters from Manhattan to the Barclays Center, MetroTech and the Hewes St subway station. To avoid the traffic hell from this morning, special express bus lanes will be set up along 3rd Ave and return down Lexington. With some better news, Cuomo also says Metro-North and Long Island Rail Road will begin limited commuter rail service starting at 2 p.m. today, meaning Grand Central will also open then. A "limited" version of the Harlem Line between North White Plains and Grand Central will run every hour, tweeted Cuomo. And riders tomorrow morning can expect "close to rg wkday sched" on the Harlem and New Haven lines starting tomorrow. The rest of the lines can expect service "as soon as possible," which you know, could be anywhere from now until weeks from now. Things don't look as great for Long Island Rail Road commuters, with power still out for 90 percent of Long Island, Cuomo says restoring power to the more than 20 downed substations is the first step. Original Post: The power in New York City will be back within days, but the status of the subway is still unknown. The whole system is still shut down with all lines suspended, as the MTA tries to fully assess the damage, which it can't do until it pumps out all the water from the tracks. To make up for the lack of transit for the 4.3 million people who use it daily, the city is offering free bus service operating as close to its normal weekday schedule as possible. The MTA has also given cabs permission to pick up multiple passengers and will allow the hailing of livery cabs on the street. In theory those are kind gestures, but in practice they have resulted in the traffic mess to the right (via Reuters), as people try to get back to work. All the busses and cabs in the city can't quite handle the masses. "Wow. Lines for MTA buses are like 40 ppl deep in Jackson Heights. And when the buses show, they are already full," tweeted Billboard's editorial director Bill Werde. The New York Times says to "expect delays, detours and crowding" on buses. Other modes of transportation aren't much better. Another tweeter says the traffic in Park Slope, miles away from the bridge, is at a total standstill. To avoid the cars, some, like Reuters's Megan McCarthy have resorted to walking across the bridge. And it could be like this for weeks. According to one 2011 study that modeled a 100-year storm with the kind of flooding we saw with Sandy, which found it would take 21 days to get back to 90 percent of normal operations. Though, there is no official estimate from the MTA, whose website doesn't even let people see the train maps, redirecting to this weather advisory. Mayor Michael Bloomberg guessed it would take four days for service to start up again. The MTA said would come back in patches. Considering all the steps the MTA has to take before it can re-open, that 21 day assessment doesn't sound too absurd. Here's what it will take before the subway is open to commuters again. 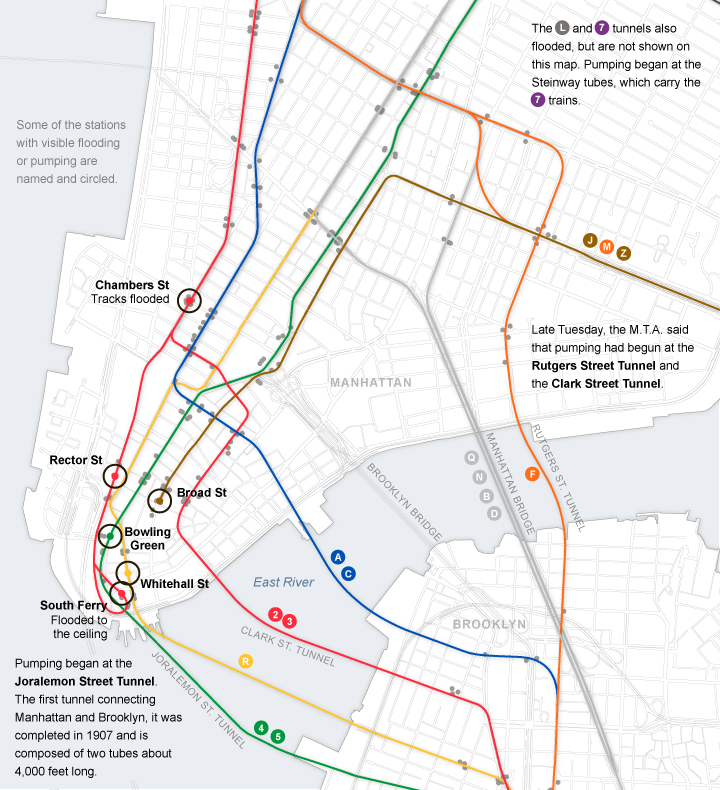 Seven subway tunnels under New York’s East River flooded, which you can see in this graphic from The New York Times. Joseph J. Lhota, chairman of the Metropolitan Transportation Authority, said flooding was "literally up to the ceiling" at the South Street subway station in Lower Manhattan, some of which you can see in the photo up top. Pumping them out could take a week, report Bloomberg's Angela Greiling Keane, Frederic Tomesco and Alan Levin, assuming officials could get 100 portable pumps. Before Sandy, the subway only had three for the entire system. This process has already begun in some of the tunnels under the East River, as the photo from the MTA Flickr shows at the South Ferry station. Only after all the water is out, can officials assess the damage. Which is no small feat: "If you laid the New York City subway system in a line, it would stretch from New York to Detroit. Now imagine inspecting every inch of that track," write Keane, Tomesco and Levin. From electrical to salt water damage, there are a number of ways the subway system could need repairs. "In the tunnels under the East River, all the signal-and-control systems are underwater. And it is salt water," Klaus Jacob, an environmental disaster expert at Columbia University told The Associated Press's David Caruso. "It’s not just that it doesn’t work right now. It all has to be cleaned, dried, reassembled and tested. And we are not sure what the long-term corrosion effect might be." Once things have dried out, then officials can start testing the thousands of connections and system signals, Mortimer Downey, a former MTA executive director and current board member of the Washington Metropolitan Area Transit Authority said to Bloomberg. Then, the repair process can begin, which isn't that simple, because it has "a lot of antique components where the vendor has been out of business for 50 years," Kathy Waters, vice president for member services at the American Public Transportation Association, also told Bloomberg. This part alone doesn't sound like a few day fix. To be safe mentally prepare for a month-long painful commute.